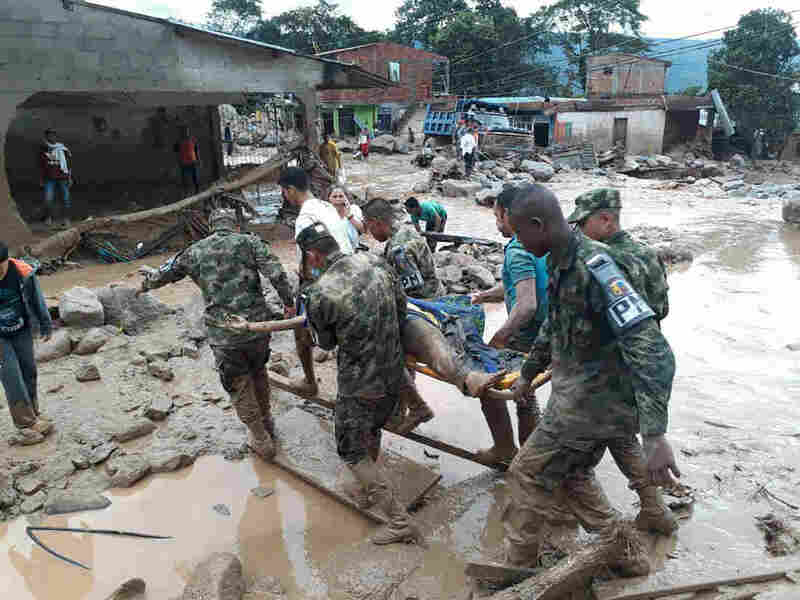 Avalanche Of Mud And Water Kills At Least 193 In Colombian City : The Two-Way Colombia's president declared a state of emergency in Mocoa, where at least 200 people are missing after overflowing rivers swept through homes and killed residents while they slept. Soldiers carry a victim on a stretcher in Mocoa, Colombia, on Saturday, after an avalanche of mud and water from an overflowing river swept through the city as people slept. The incident triggered by intense rains left at least 125 people dead. A sudden avalanche of mud and water tore through the Colombian city of Mocoa overnight Friday night, killing scores of people while they slept. At least 193 people were killed, according to President Juan Manuel Santos. The Colombian Red Cross reported Saturday that 220 people are missing, and 400 were injured in the disaster. Mocoa is in the Putumayo province, along the country's southern border with Ecuador. The 40,000-person city sits between two mountains at the crux of two rivers that overflowed after intense rains, according to the Associated Press: "Muddy water and debris quickly surged through the city's streets, toppling homes, ripping trees from their roots, lifting cars and trucks and carrying them downstream." President Santos visited the city on Saturday and declared a state of emergency, to mobilize rescue operations. "We don't know how many there are going to be," he said about the death toll. "We're still looking." An alarm reportedly went off to alert residents but wasn't audible throughout the city. Witnesses told the AP that they felt buildings vibrate, and that many did not have enough time to retreat to roofs or higher ground. The AP spoke with Herman Granados, an anesthesiologist at the local hospital, who had worked throughout the night on victims. He said the hospital didn't have enough blood to deal with the crisis, and they were running out of supplies. Some of the hospital workers had family among the missing. "Under the mud," Granados said, "I am sure there are many more." Colombia's mountainous landscape and informally constructed homes make landslides relatively common when there are heavy rains, according to Reuters.